Location of Russellville in Franklin County, Alabama. Russellville is named after Major William Russell, an early settler in the area who helped in the construction of Jackson's Military Road. The town grew at this road's intersection with the Gaines Trace. Russellville was incorporated on November 27, 1819. Russellville served as the first county seat from 1818-1849 before it was removed to Frankfort (which served from 1849-1879). After the fire at the courthouse in the third county seat of Belgreen in 1890, the seat was returned to Russellville in 1891. Russellville is located in northeastern Franklin County. U.S. Route 43 passes through the eastern side of the city, leading north 18 miles (29 km) to Muscle Shoals on the Tennessee River and southwest 31 miles (50 km) to Hamilton. Alabama State Route 24 passes through the south side of the city, leading east 47 miles (76 km) to Decatur on the Tennessee River and west 26 miles (42 km) to Red Bay at the Mississippi border. According to the U.S. Census Bureau, Russellville has a total area of 13.5 square miles (35.0 km2), of which 13.4 square miles (34.7 km2) is land and 0.1 square miles (0.3 km2), or 0.79%, is water. At the 2010 census, there were 9,830 people and 3,556 households. The population density was 677.9 per square mile (261.8/km²). There were 3,882 housing units at an average density of 293.3 per square mile (113.3/km²). The racial makeup of the city was 73.68% White, 11.25% Black or African American, 0.35% Native American, 0.12% Asian, 0.27% Pacific Islander, 7.54% from other races, and 1.17% from two or more races. 12.64% of the population were Hispanic or Latino of any race. There were 3,556 households of which 30.6% had children under the age of 18 living with them, 50.9% were married couples living together, 12.6% had a female householder with no husband present, and 33.5% were non-families. 30.8% of all households were made up of individuals and 16.0% had someone living alone who was 65 years of age or older. The average household size was 2.44 and the average family size was 3.03. Age distribution was 24.2% under the age of 18, 9.8% from 18 to 24, 26.5% from 25 to 44, 21.6% from 45 to 64, and 17.9% who were 65 years of age or older. The median age was 37 years. For every 100 females, there are 89.6 males. For every 100 females age 18 and over, there were 85.3 males. The median household income was $25,333, and the median family income was $35,799. Males had a median income of $27,238 versus $18,551 for females. The per capita income for the city was $14,871. About 16.7% of families and 22.2% of the population were below the poverty line, including 29.2% of those under age 18 and 24.9% of those age 65 or over. Watermelon Festival - The annual "Watermelon Festival" is held each August in downtown Russellville, and includes music and entertainment, car and tractor shows, and arts and crafts. Roxy Theater - Built in 1949, the theater originally served primarily as a movie cinema, but saw a major decline in the early 1980s. It now has been revitalized as an entertainment venue due to the efforts of The Franklin County Arts and Humanities Council and the support of local citizens. The theatre is now primarily used for musical events, including benefit concerts and the "Rockin' at the Roxy" show each month with the KGB (Kerry Gilbert Band), as well as the Country Showdown talent search contest. King Drive-In - The King Drive-In is located just north of Russellville on Highway 43. One of the few drive-in movie theaters still operating in Alabama, it plays currently released films throughout the spring and summer on Friday, Saturday and Sunday nights. The theater features old-style speakers that hang on car windows, but also offers the soundtrack of films through FM radio broadcasts, as well. The Strip - From the 1960s until approximately 2000, "The Downtown Strip" had been a source of entertainment for local teenagers throughout Franklin County. This strip is best described as having the atmosphere of George Lucas' iconic film, American Graffiti. Cruising the strip ended near the end of 2004 due to an increased local police presence in the area. RHS stadium - Russellville High School Stadium is a place where local residents watch the high school football team play. Russellville's football team ranks as one of the most successful teams in Alabama in terms of all-time playoff wins. WMTY-TV features area events about the Russellville area including news and weather, though most programming is religious. Its translator station is W46DF-D. Radio stations include WKAX AM 1500, WGOL AM 920, and WPMR-LP 99.7 FM. Russellville's newspapers are The Franklin Free Press and the Franklin County Times. Luther Duncan, pioneer of 4-H youth development, a director of the Alabama Extension Service (now Alabama Cooperative Extension System) and president of the Alabama Polytechnic Institute (now Auburn University). Born near Russellville. Thomas William Sadler, U.S. congressman from 1885 to 1887. Born near Russellville. ^ a b "Geographic Identifiers: 2010 Census Summary File 1 (G001): Russellville city, Alabama". American Factfinder. U.S. Census Bureau. Retrieved April 12, 2016. ^ RussellvilleGov.com (2004). "History of Russellville". Archived page of 22 March 2004. ^ "Announcements". Times Daily. Oct 20, 1932. p. 3. Retrieved 28 May 2015. ^ Our History, Franklin County official website. Accessed 27 September 2018. ^ Watermelon Festival, Franklin County Chamber of Commerce official site. Accessed 27 September 2018. ^ "Roxy Theatre Receives Lasting Impression Awards," Franklin County Times, 7 October 2015. ^ John Pilati, "Baldwin to Perform Benefit Concert This Saturday at Roxy," Franklin Free Press, 15 May 2018. ^ Pounders, Vicki (April 20, 1989). "Russellville drive-in still going after 40 years". Times-Daily. Florence, AL: Tennessee Valley Printing Co. pp. 1A, 5A. Retrieved March 28, 2013. ^ Jim Hannon, "Cruisin' the Strip," Florence TimesDaily, 13 March 2011. ^ Playoff Team Records, Alabama High School Football Historical Society. Accessed 27 September 2018. ^ Smith, Jack D., "Information and Inspiration: An Early History of the Alabama Cooperative Extension Service," (Unpublished Manuscript Prepared for Alabama Extension's 75th Anniversary), March 29, 1989. 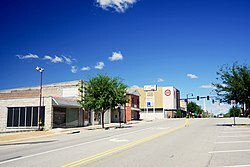 Wikimedia Commons has media related to Russellville, Alabama.